April 10, 2015 Copyright © BirdNest Services, Inc., 2008 BirdNest Services Helping our customers manage the most valuable resource on the planet! Data. 1 April 10, 2015 Copyright © BirdNest Services, Inc., 2008 BirdNest Services Helping our customers manage the most valuable resource on the planet! Data Efficiency for Water and Wastewater Management Clean Rivers data service Available and in use Today! No Software to install and no equipment to buy! 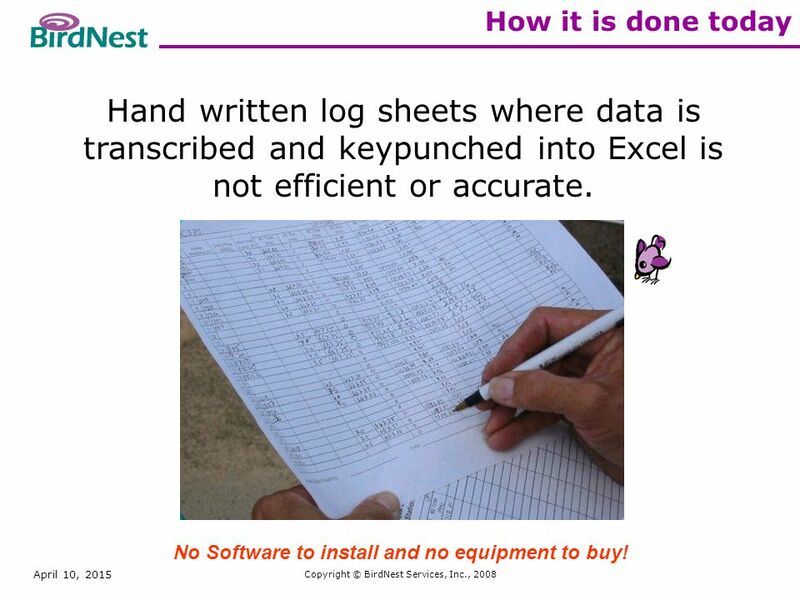 2 April 10, 2015 Copyright © BirdNest Services, Inc., 2008 How it is done today Hand written log sheets where data is transcribed and keypunched into Excel is not efficient or accurate. No Software to install and no equipment to buy! 3 April 10, 2015 Copyright © BirdNest Services, Inc., 2008 How it is done today How many times is your Clean Rivers data handled from the time it is collected until it is formatted and submitted? No Software to install and no equipment to buy! 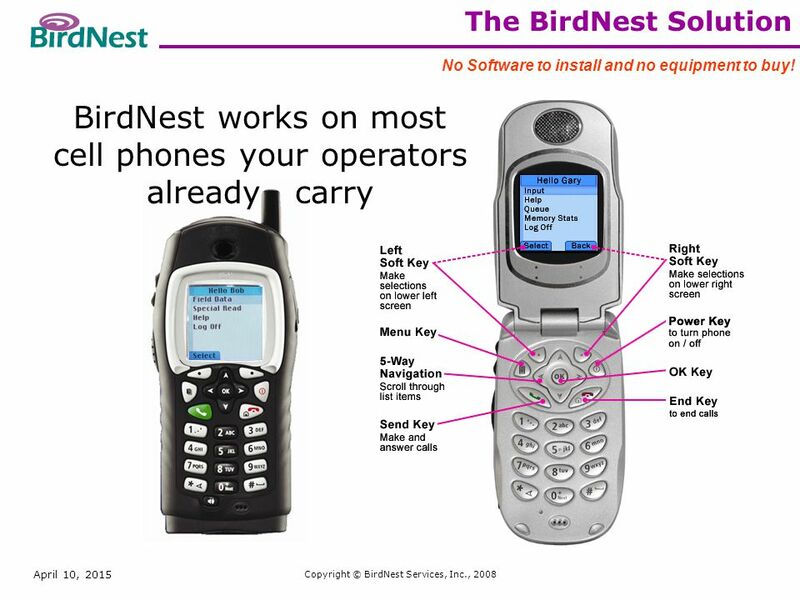 4 April 10, 2015 Copyright © BirdNest Services, Inc., 2008 The BirdNest Solution BirdNest works on most cell phones your operators already carry No Software to install and no equipment to buy! 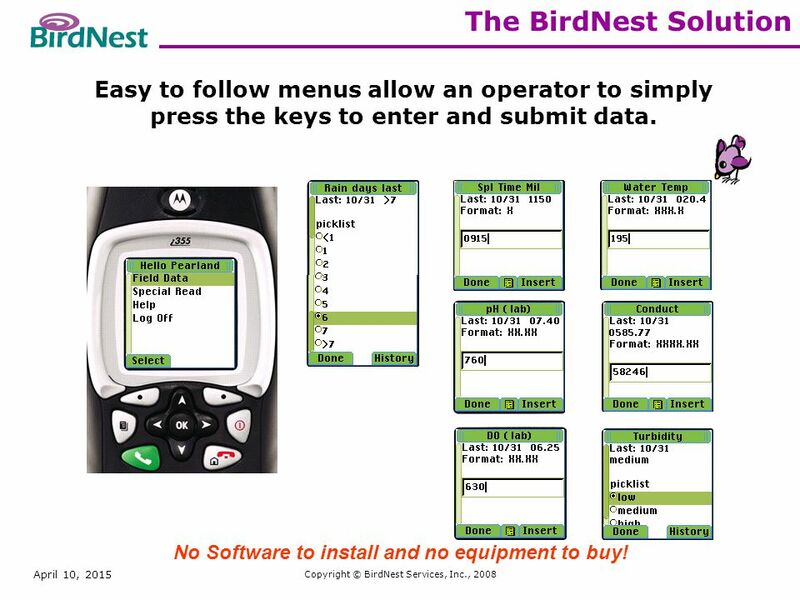 5 April 10, 2015 Copyright © BirdNest Services, Inc., 2008 The BirdNest Solution Easy to follow menus allow an operator to simply press the keys to enter and submit data. No Software to install and no equipment to buy! 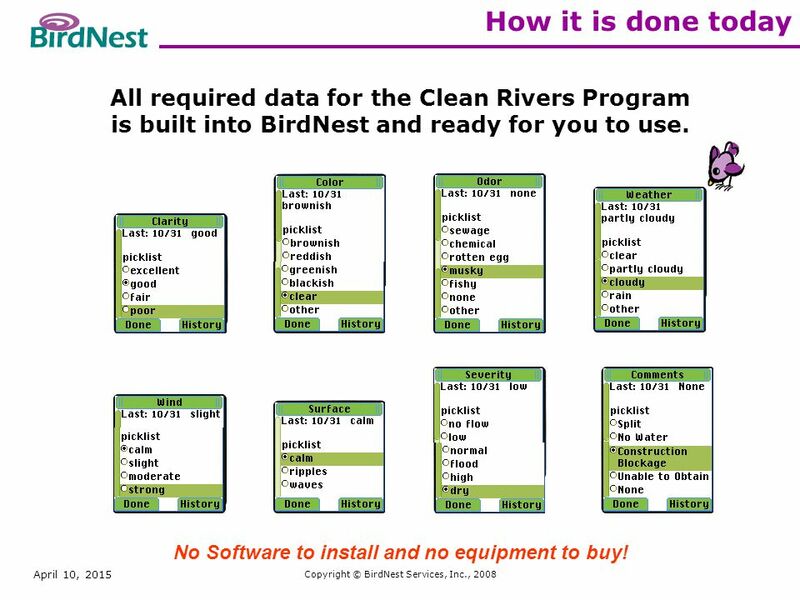 6 April 10, 2015 Copyright © BirdNest Services, Inc., 2008 How it is done today All required data for the Clean Rivers Program is built into BirdNest and ready for you to use. No Software to install and no equipment to buy! 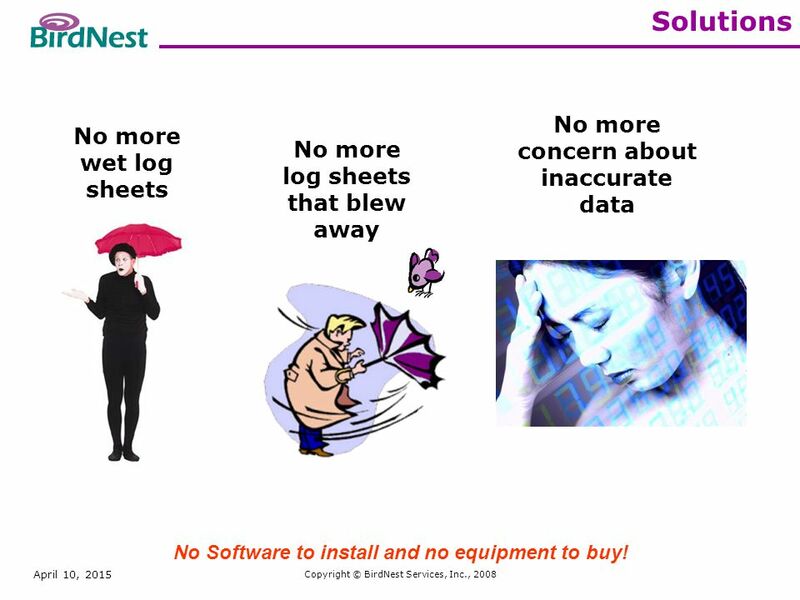 7 April 10, 2015 Copyright © BirdNest Services, Inc., 2008 Solutions No more wet log sheets No more log sheets that blew away No more concern about inaccurate data No Software to install and no equipment to buy! 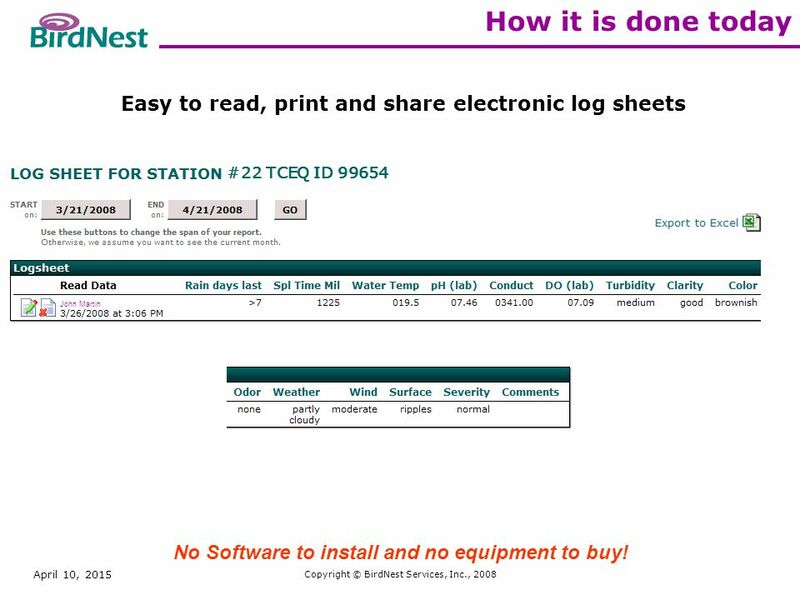 8 April 10, 2015 Copyright © BirdNest Services, Inc., 2008 How it is done today Easy to read, print and share electronic log sheets John Martin #22 TCEQ ID 99654 No Software to install and no equipment to buy! 9 April 10, 2015 Copyright © BirdNest Services, Inc., 2008 Available, Usable and Reliable Data Data for all stations are available on a single report that can be reviewed, printed and shared. You can allow access to these reports saving time submitting the data. No further effort or work on your part is needed, saving a lot of time and providing a very efficient method for this data transfer. 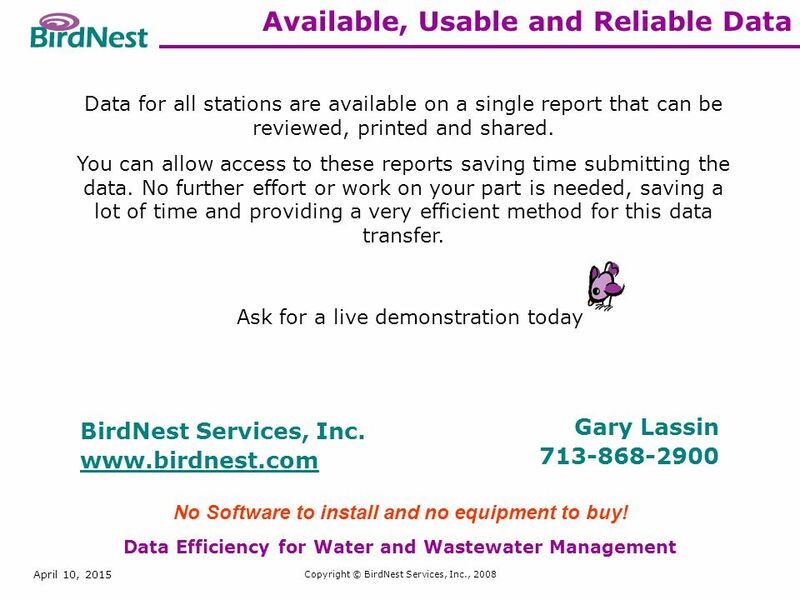 Ask for a live demonstration today Gary Lassin 713-868-2900 BirdNest Services, Inc. www.birdnest.com Data Efficiency for Water and Wastewater Management No Software to install and no equipment to buy! Download ppt "April 10, 2015 Copyright © BirdNest Services, Inc., 2008 BirdNest Services Helping our customers manage the most valuable resource on the planet! Data." Does What We Throw Away Affect Others?. DID YOU KNOW? About one-third of an average landfill is made up of packaging material Each Sunday. Reducing Peak Demand using Self-Organizing Systems Reducing Peak Demand using Self-Organizing Systems Follow Natures Lead Copyright 2007 REGEN Energy Inc.
Site License Considerations (SIC 99) Chris Thornton Thornsoft Development, Inc.
BSofts Order Shipping Terminal The information pipeline for your companys order status data Bringing you what you need.. when you need it! Providing Pre and Post Move Services to the Moving Industry Along the Colorado Front Range and SE Wyoming to Welcome. Chapter 1 Getting Started with Access Databases. Objectives Identify Good Database Design Create a Table and Define Fields in a New Blank Database Change. 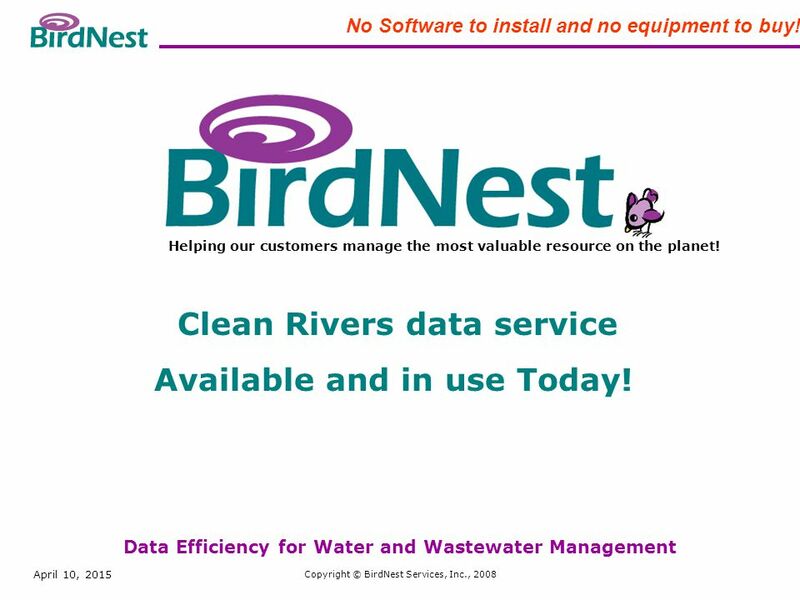 BirdNest Services Available Usable Reliable Data Efficiency for Water and Wastewater Management Reports To change slides use the page up and page down. Baltic High School Classroom Connections Presentation. Electronic Certificates. Benefits of Electronic Certificates Create fast and efficient export certificates. Via the internet, no need for special programs. Online Notification Effective 5/23/11 Death Communication Form. How It’s Done. Determine where water is being used in the facility Examine and analyze all areas of water use Calculate and account for water use Propose.